The jeweler to Queen Elizabeth II, Dr. Stuart Devlin, created the design for this beautiful 2012 1/4 oz Gold Kangaroo, which features a single kangaroo with a bush scene and windmill in the background. 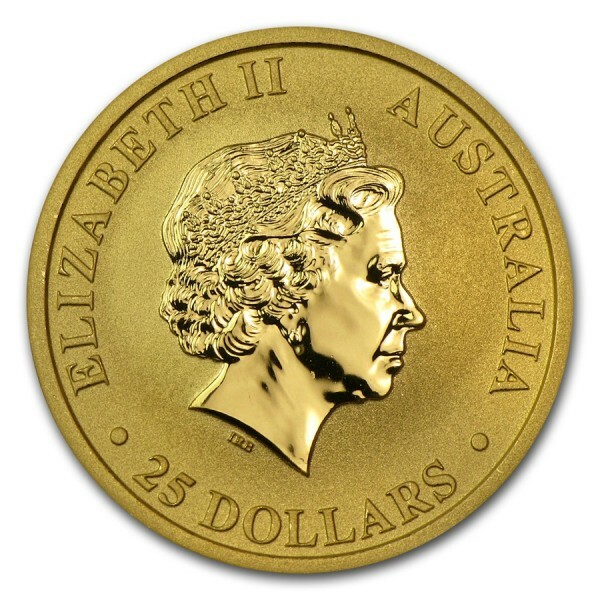 The mint mark, “P,” appears on the reverse of each coin size, along with the inscriptions “Australian Kangaroo,” the date, the size of the coin, and the purity, “9999 Gold.” The obverse of each coin shows the Ian Rank-Broadley likeness of Queen Elizabeth II, as well as the coin’s monetary denomination, 25 Australian dollars. 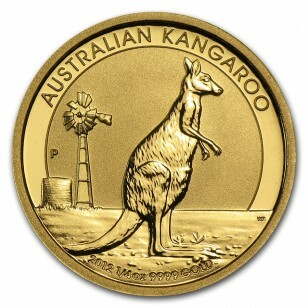 This Australian Gold Kangaroo coin is held in a plastic capsule.